Use up your leftover parsley with this deliciously, flavorful Garlicky, Cheesy Parsley Bread. It’s the perfect side dish for a bowl of pasta. It’s officially comfort food season, which pretty much means every meal deserves to be served with a crunchy loaf of bread. I wouldn’t mind having a slice of this Garlicky, Cheesy Parsley Bread alongside my Weeknight Italian Sausage Pasta or a serving of this Penne Pizza Pasta Bake. There is nothing easier than making a loaf of garlic bread to go with a meal. It’s the perfect side to so many delicious things. It sops of the sauce of our pasta dishes and stands up of to a bowl of chili in a way you didn’t think possible. 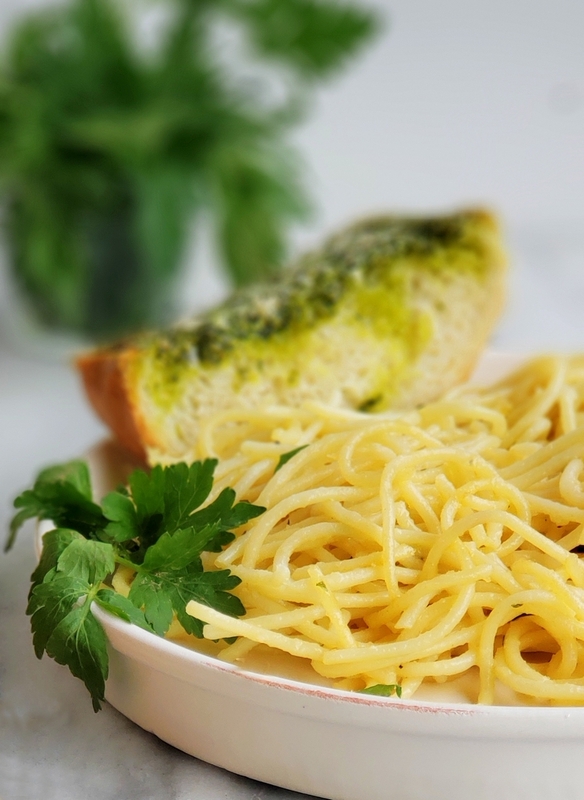 However, sometimes we want a little bit more out of our garlic bread or maybe just something a little different or fancier to serve at a dinner party. 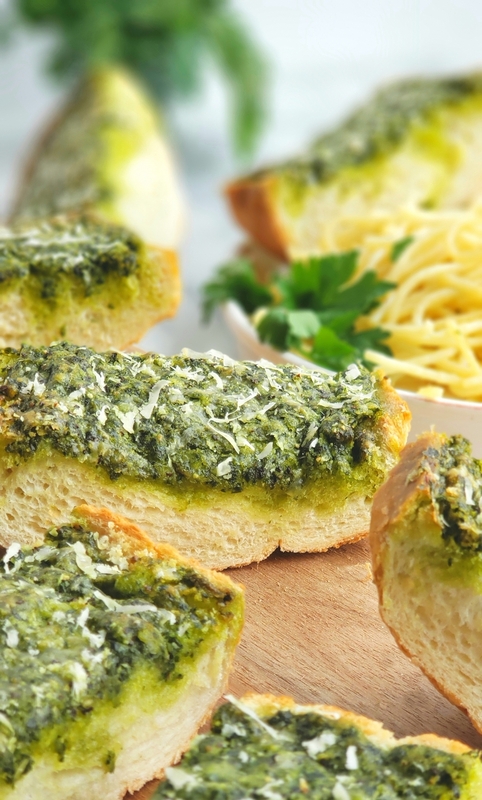 I can highly recommend this Garlicky, Cheesy Parsley Bread to satisfy all those requirements. 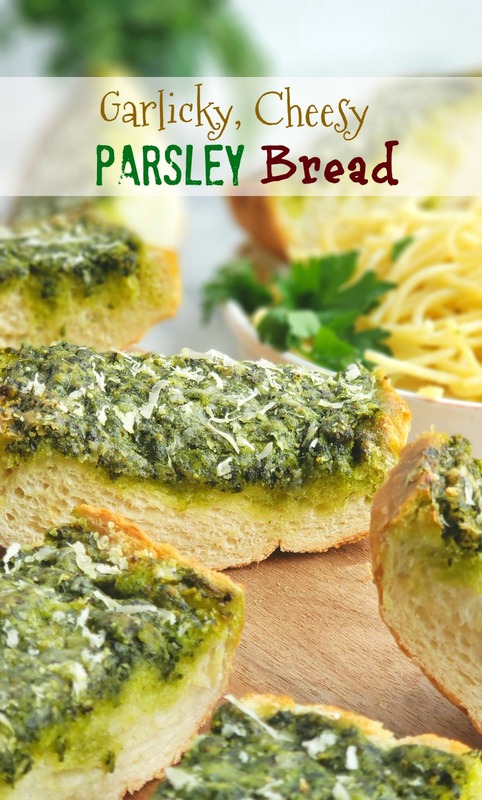 I chose to use Italian flat-leaf parsley with this bread vs. curly-leaf parsley. Italian flat-leaf parsley has a more robust flavor. I tend to use curly-leaf parsley for decoration only, I also think the curly-leaf variety is slightly bitter. The textures of each parsley really didn’t matter with this particular recipe, since the parsley is pureed in the end. Overall, you’ll be much happier with the slight edge of flavor the flat-leaf parsley brings to this dish. One of the reasons I love making this bread is that I get to use up my leftover parsley. I am always buying these huge bunches of parsley, only to use a tablespoon of two in a recipe. I ended up throwing so much of it away until I started making this bread. I’m sure most of you can relate! It never feels good to be wasteful. Yes it is! Ten sprigs of parsley are enough to reach the recommended daily intake of vitamin K. Parsley is also an excellent source of vitamin C, vitamin A, folate and iron. Parsley is also low in calories, making it great for a topping on calorie-dense bread. This is the bread looks before going into the oven. Make sure to spread the parsley mixture in a thick layer. This will help it permeate the breads as it bakes. I chose a loaf of French bread for this recipe because I like the softness of the loaf when it comes to garlic bread. However, feel free to use any type of bread you have on hand. Just make sure it’s a one-pond loaf. Again, you can serve anything with bread from salad to chili, but for a super, quick and easy weeknight meal, this 5-Minute No-Cook Pasta Sauce is perfection. Sadly, there won’t be any leftovers. 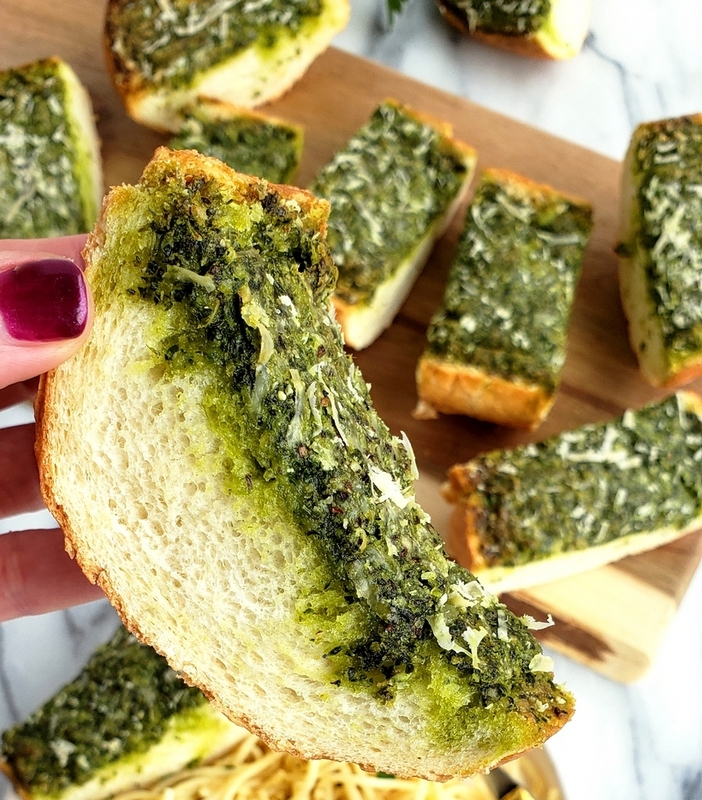 Use up your leftover parsley with this deliciously, flavorful Garlicky, Cheesy Parsley Bread. It's the perfect side dish for a bowl of pasta. Preheat oven to 450 degrees F. Prepare a baking sheet lined with parchment paper. 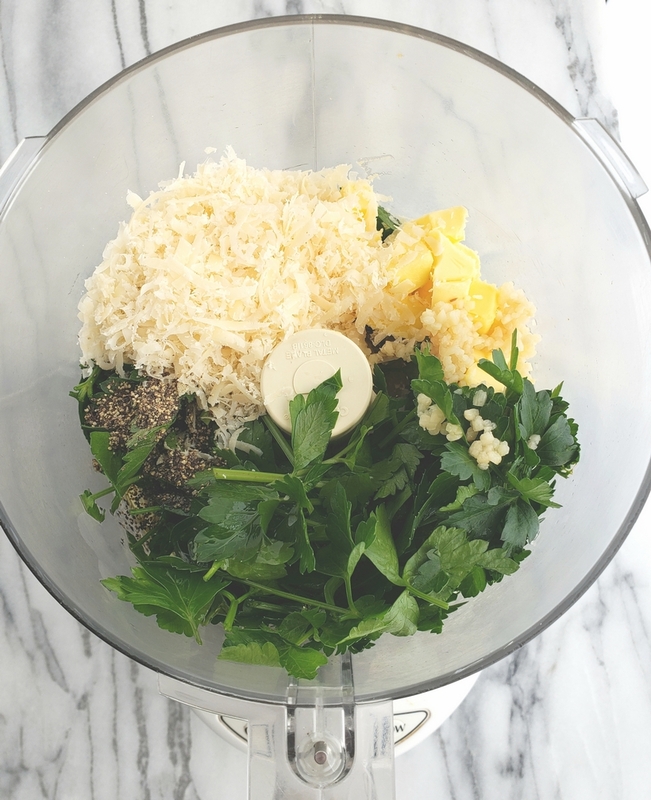 Add parsley, butter, olive oil, cheese, garlic, pepper and salt to the bowl of a food processor and process until smooth. 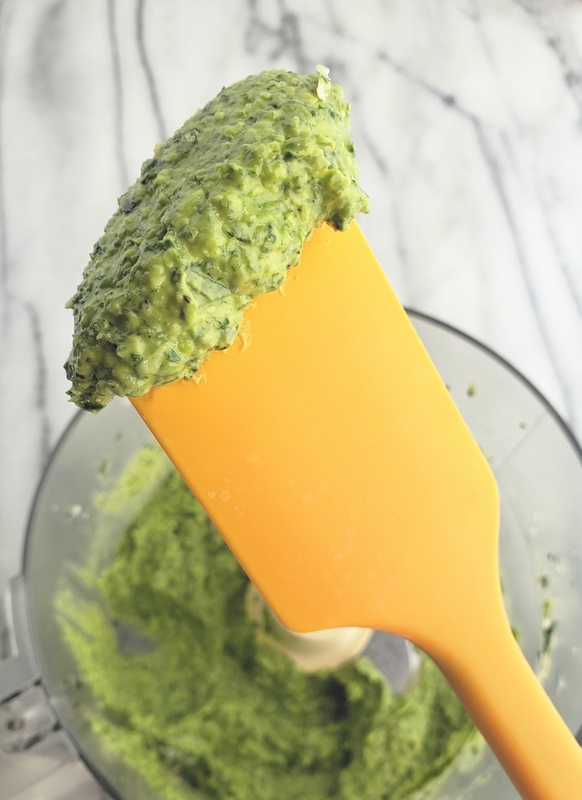 Spread the parsley mixture over cut sides of bread in a thick layer. Place bread, cut sides up in the preheated oven for 15 minutes or until edges are golden brown. Slice bread and serve warm. Made this last night and it disappeared in 10 minutes. 5 Stars all the way! 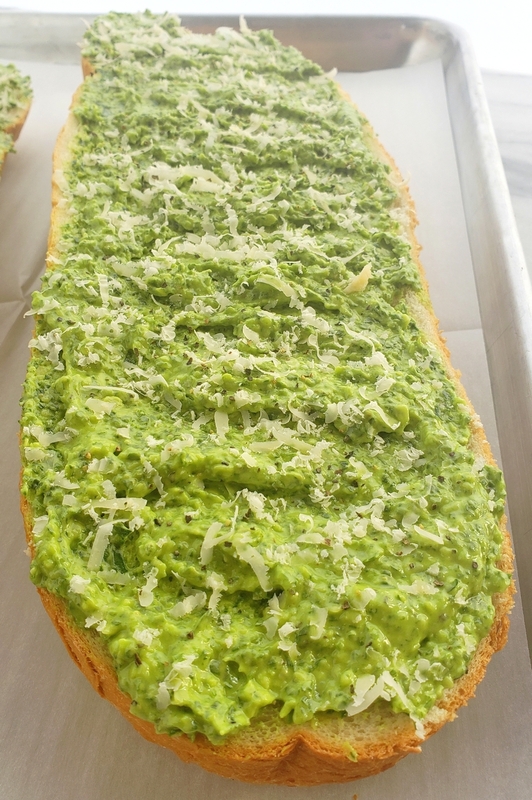 Such a delicious way to change up garlic bread. I like this so much more than the usual garlic bread. Perfect amount of parsley! Total comfort. In love with this recipe! These are a new favorite in my house! You just jacked up garlic bread to make it 10X more delish!